What’s the best log splitter? Well, before we get into all the details I need to give you some background information to put everything into context. The best log splitter for you really depends on your needs. But more on that later. Electric and gas log splitters can take the hard work out of chopping logs for firewood or other purposes. But you may wonder if you actually need one. You might be asking yourself what’s wrong with using an axe? Splitting logs by hand with an axe (or a sledge and wedge) is one of those tasks that’s supposed to build character. And there is some truth to that; reducing a big pile of logs to kindling with nothing more than an ax and the sweat of your brow is rewarding. For teenagers, it can teach a useful lesson about persistence and hard work. But by the time you reach the age of thirty, you’ve probably developed as much character as your going to get. At this point, it makes more sense to look after your health. LeverAxe : An interesting invention but it’s still an axe with a different name. At a fundamental level, the axe is an amazingly efficient machine. It’s highly portable and it works well. It also has the advantage of being cheap and simple to use (no manual to read or tech support hot-line to call). But it relies on human power, which means that it can get tiring fast. Plus using it can lead to problems such as back strain and joint injuries caused by repetitive impacts. And even if you have the stamina of an ox, it can still take a long time to chop up the wood you need. On the other hand, a log splitter can do the work in a handful of minutes. Boss log splitters provide excellent value for your money. Can be safely used in your basement or garage. Built-in wheels makes it easy to move around. Easy to operate with gloves on. Log splitters take the backache out of chopping firewood, and they get the job done quickly. There are even log splitters with a built-in lift, to reduce the strain of picking up heavy logs. There are lots of different models of log splitter. Some are intended for heavy industrial level use, and others are for occasional use by homeowners. And because it’s such a useful machine for country living, there are companies making them all over the world. They’ve been around in one form or another for over a century, but they really became popular in the early 60s. Before then, they were only for lumber yards and mills. There are even some steam powered splitters still in use around the world, although most of them have been replaced by now. Electric powered hydraulic log splitters. Machine mounted (for use with a tractor). Each of these has its own advantages and disadvantages, so there is no single “best log splitter” for everyone. Let’s take a look at these types in more depth, starting with the manual log splitters. These log splitters do not have their own power source. Instead, it’s up to you to do the work. They aren’t as tiring as an ax, and they are also less strain to use. Because the machine is specially designed for splitting logs, it offers more control. There is no chance of a log deflecting a blow, sending the ax on a dangerous path. So a manual log splitter is a safer option. But it can still get tiring pretty fast, which is why most people prefer a powered log splitter. There are 2 types of hydraulic log splitters, electric and gas. The main difference among these different varieties is the power source. They all use a motor to drive a hydraulic pump, which is used to drive a piston. It’s this piston that does the splitting. The hydraulics push the log into a stationary blade, which splits the log neatly. A variation on this design holds the log in place and moves the blade. With the moving blade models, it’s possible to get a splitter with a double edged blade, which can cut in two directions. This is the best log splitter if you need a lot of firewood quickly – you can get a really good rhythm going, and split logs at an amazing pace. If you need smaller pieces or kindling, you can feed the pieces back in to get smaller sections. Electric log splitters are designed for the light-duty needs of homeowners. These devices are powerful, and you don’t have to worry about gas and exhaust. That makes it possible to use them indoors, which is very useful when the weather is bad. If you are planning to use them outside, you need to have a source of electricity. If you find yourself tripping over extension leads, you’ll probably wish you bought a gas powered model. Electric models are cheaper and lighter than the gas powered splitters. So, if you don’t need extra power, they are the best log splitter variety for your needs. With no fuel burned, they are cleaner, too. This also means no emissions, smoke or soot. The electric motor requires less maintenance, so you won’t need to make any messy oil changes. And you won’t need to feed it with expensive gas, either. No internal combustion engine means that these splitters are cheaper, quieter and cleaner than their gas-powered equivalents. Most electric log splitters have a splitting force in the 4-7 tons range, but they can go as high as 20 tons. Gas is ideal for high-volume splitting, or for hardwoods. These log splitters are more mobile than electric splitters, as you are not tied down to an electrical outlet. You can split wood wherever you need it, even if it’s far from a building. 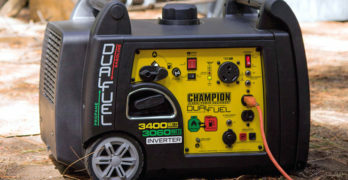 There are some very powerful gas powered models available, and the top of the range models beat anything an electric splitter can do in terms of pure power. If you need to split tough hardwood, then this is the best log splitter variety. More power also means that they are faster, which is important if you need to split a lot of wood. This device is designed to be attached to a tractor, and it uses the vehicle as a power source. That means that these models can be very powerful indeed. It’s important to make sure you choose a model that’s compatible with your tractor, otherwise it may not work. Powered by the inertia of 2 flywheels. These log splitters do not have a “ton” rating, as they do not use hydraulics. But in terms of force, they are generally more powerful than a 30-ton hydraulic log splitter. They use a motor (gas or electric) to drive a flywheel. This builds up a lot of kinetic energy, which is released into the arm. The action is very fast, making this the fastest type of log splitter. If you were splitting logs to sell firewood, you’d have to get a lot of logs split in a short amount of time. This would be the best log splitter for that purpose. For most homeowners, a simple gas or electric hydraulic system will be the best log splitter option. The machine mounted splitter and the kinetic version are fast and impressive, but they’re also expensive. If you were splitting logs for a living, then they would be the right choice for you. But for occasional log splitting, the simpler systems are better. The machine powers through a task that would take real effort if you were using an ax. It makes it look smooth and effortless, but the hydraulics are actually driving about 10 tons of force. So it’s little wonder the logs split so easily. This means that hours of tiring work is reduced to a few minutes. You spare yourself the backache and get the job done quickly, which is a big win. Goggles are essential. They’re very inexpensive. Your health is priceless. Of course, a device that uses 10 tons of pressure to drive a log into a blade has the potential to cause serious injury. The terrible pressure that effortlessly splits logs can also break or sever fingers or limbs. That’s why many modern log splitters are designed to require 2 hands to operate. The 2 handed design means you must use one hand must hold down a switch while the other hand operates a lever. Stopping the machine is extremely easy, too. All you need to do is take one hand or the other away from the controls. The double hand feature is not included in all log splitters, but it’s not a huge problem. As long as you keep your wits about you and follow sensible safety precautions, you’ll be able to keep your arms attached. There is also a risk of splinters shooting off under high pressure, so you should use goggles to protect your eyes, and make sure people don’t stand too close to the machine while it’s working. Splinters can also be a problem when handling the logs after they’ve been split. Now, a splinter isn’t going to cost you an arm, but it can be irritating and painful, and they can cause infections. So it makes sense to wear thick gloves when you use a log splitter. Work gloves will prevent you from getting splinters — & cuts. For powerful gas powered splitters, sound can be a problem. Prolonged exposure to loud sounds can hurt the ears, so you should use ear protection. Split logs can fall off of the machine (especially if they are at the size limit), so you need to stand in a safe position. Wearing steel toed boots will protect your toes even if a log falls off in the wrong direction. Every log splitter has a safety zone. Stay within it. These machines are powerful, but they have limits. Specifically, they are only able to handle logs up to a certain size (length and diameter.) It’s important to respect these limitations, otherwise bad things can happen. Things like logs shooting out sideways, or the machine breaking or falling over while running. These machines are all made to run in a certain orientation (vertical or horizontal). Using them in the wrong orientation is an invitation to a catastrophe. ✓ Safety Reminder: Wear steel-toed boots (or shoes), safety goggles, safety gloves, protective hair covering and suitable work clothing. Never wear jewelry, necktie and other loose clothing! In short, these are very powerful machines and have to be treated sensibly and with respect. They’re only dangerous if you use them wrongly. Now we have taken a look at the different types of log splitters, it’s time to decide on the best log splitter for you. Here are some of the best models available for homeowners right now. Use indoors or outdoors. Compact, quiet and affordable. View or download the MANUAL for the Boss Industrial ES7T20. 7 tons of splitting force. 2 HP Electric Motor. 3,500 psi hydraulic pressure. Split logs up to 20.5″ in length; up to 10″ in diameter. Easy push button electronic start. Fully assembled – no assembly required. Watch this video and see it in action. This splitter has an excellent history of customer sanctification. 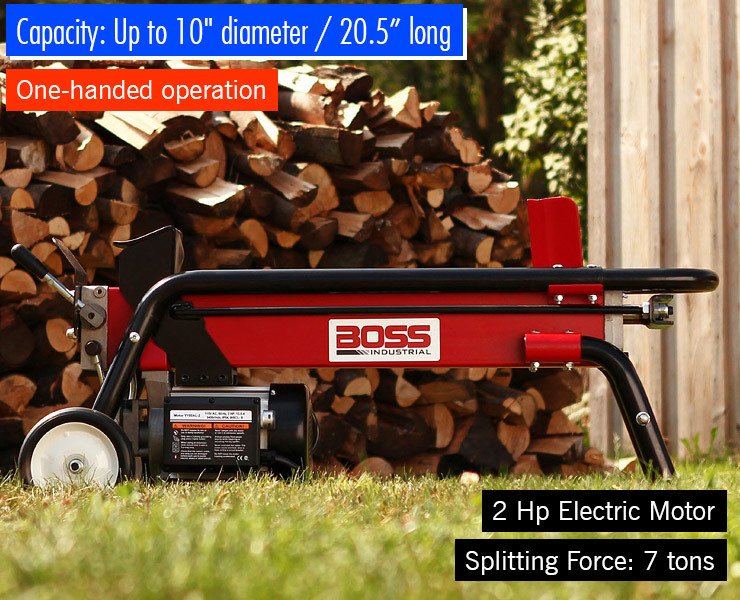 The Boss ES7T20 is an electric powered hydraulic log splitter with 7 tons of force. It features a fixed blade, which the log is pushed against. It’s designed for one-handed operation, which is convenient, but remember to take care with your other hand! The automatic ram return will prepare it for the next log – this helps you to get an efficient rhythm going. With a lightweight 2hp electric motor, this is a relatively lightweight and portable splitter. 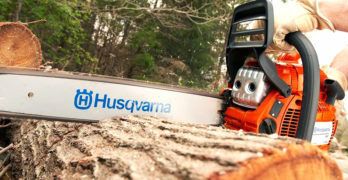 It’s covered by a 2 year residential warranty; if you are planning to use it in a commercial capacity, that warranty is reduced to just 90 days, so this clearly isn’t the best log splitter for heavy work, despite its name. You will need to change the hydraulic oil after every 100 hours of use. It comes filled with AW32 universal hydraulic oil. At a pinch, you can use Dextron II transmission fluid as an alternative, but A32 is preferable. You must be careful not to mix the two fluids. Users claim that it’s able to split logs like butter and have used it successfully with aspen, spruce, oak, cherry, and pine. If the splitter cannot break through the log on the first try, you just need to switch off the motor, return the ram to its starting position, and try again. It is able to split logs up to 10″ in diameter and 20.5″ in length. This is a good choice for an everyday log splitter. The 7 tons of force is powerful enough to split most logs, although you may occasionally have troubles with knotty wood. Ideal for light-duty log splitting. The most popular log splitter on Amazon. 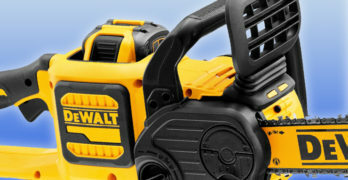 Reliable, inexpensive and easy to operate. View or download the MANUAL for the WEN 56206. Can be safely used indoors and outdoors. The WEN 56206 is an electric log splitter, with a 2HP electric engine. It uses a fixed blade like the Boss Industrial ES7T20. The WEN 56206 delivers only 6-tons of splitting force compared to the ES7T20’s 7, so it is a slightly less powerful beast. But it is also more than a hundred dollars cheaper. What’s more, it’s also designed to be safer to operate. It has a two handed action, so it’s impossible to get your hand stuck in a dangerous position. Of course, you still need to make sure nobody else puts their hands in harm’s way. Watch this video and see it in all its splitting glory. The log cradle ensures that the logs are kept in the right position as they are driven towards the blade. This makes the splitter easier to use, and it’s also a safety feature. Logs are less likely to pop out over the side due to misalignment, which means there’s less chance of getting hit by one. It can handle logs up to 10″ in diameter and 20.5″ in length. The manufacturer’s warranty covers 2 years of regular use. The community has taken to this device with some enthusiasm, but there are some small drawbacks. The manual is poorly written, and an important vent valve is not clearly labeled. It’s important to open this valve when the machine is running and close it when it’s in storage – if you don’t, the hydraulics can suffer damage. So you should take the time to familiarize yourself with it if you buy this model. Small annoyances aside, this is the best log splitter if you have modest needs and want the additional safety of the 2 handed operation. This is a heavy-duty towable log splitter. Ideal for commercial environments, like farming, and landscaping. Can handle hardwood and knotty wood with ease. View or download the MANUAL for the Dirty Hand Tools 100171. 22-Ton. 6.5HP/196cc Kohler SH265 4-Cycle Engine. 11 second cycle time – down and back. 2 stage 13-GPM pump. Can split logs up to 25 inches. 4″ diameter cylinder with 24″ stroke. Towable: 2″ ball with safety chains and DOT approved 16″ Tires. 8″ foot plate and removable stripper plates. Auto return and adjustable detent. 16″ O.D. High Speed Road Tires. Heat treated steel for high durability. Made in the USA — and you’ll be happy to know it’s a bargain. Dirty Hand Tools is an American company that you may be unfamiliar with but don’t let that get in your way of purchasing this high-quality log splitter. You get a lot for your money. The company designs and engineers all of their products in-house in Colorado. If you’re looking for a high-volume gas log splitter to then you be foolish not to seriously consider this exceptional log splitter. The Dirty Hand Tools 100171 is a gas powered log splitter, and at 22 tons of splitting force, it’s a lot stronger than the other two options above. Of course, that extra power doesn’t come for free. The 100171 is the most expensive option on the list. The benefit of all this power is that it can power through all woods, even the knottiest, gnarliest hardwood. It has a 10.9-second cycle, so in theory you could split just under 6 logs per minute. With the optional catcher accessory, you can effortlessly collect the split logs, allowing you to focus on feeding more logs into the machine. It can handle logs up to 25″ in length with ease, although the manufacturer does not specify a maximum diameter. Haul this machinery around town if you want. It has wheels for easy transportation and is road towable. Being gas powered means you are not tied down to an electrical outlet. As this is a gas powered device, there are some issues you should be aware of. Sparks from internal combustion engines can cause fires in scrubland, forest or dry grass. If you plan to use it in these areas, you will need to use a spark arrester on the exhaust (which you can buy from the manufacturer). This is mandatory in California and several other states. Also, as it produces fumes such as carbon monoxide, you must run it outside. Unlike the other splitters on this list, this one can run in vertical or horizontal orientations. For raw power, dealing with difficult logs, and speed of work, this is the best log splitter. 4-Ton log Splitter can easily split a cord of wood. Two Hand operation makes it safe to operate. Wood size: 20” long x 12” diameter. Auto-Return ram increases your speed and efficiency. Delivered fully assembled. Ready to use when it arrives at your door. Heavy Duty Steel Construction. Built for long-term durability. Requires Standard Household 15 amp Circuit. The Champion Power Equipment 90720 is a gasoline 7-ton log splitter powered by a hydraulic system. Designed to split wood logs for use as firewood for your stove or fireplace. The manual explicitly states that this “log splitter will only split logs lengthwise, with the grain only.” Keep that in mind before deciding to purchase this log splitter. Must have at least 7-feet of clearance from any material that could catch fire. Also requires at least 3-feet of clearance on all sides for adequate cooling. occupied or confined spaces which can lead to carbon monoxide poisoning. this is a serious issue that you need to be aware of. Never use a gas wood splitter indoors. This model is designed to be used outdoors at all times. View or download the MANUAL for the Champion Power Equipment 90720.